Production area: Town of San Marzano Oliveto, typical area of production of this DOCG wine. Vineyards: Town of San Marzano Oliveto. Pruning system is Guyot. Planted in the years of 1954, 1975 and 1981. Working techniques in the vineyards: Pruning leaving 7/8buds. Activities in the vineyards are guided by a modern Biodynamic method, they are certified organic by “Solo e Salute”. Manual grass mowing. Harvesting: Manual harvesting with baskets, followed by analysis of maturation, generally in the second week of September. Light straw-colored yellow. Fruit scents, intense with scents of mint, Camomile and acacia. Aromatic and balanced sweet taste. This a wine produced with selected grapes that come from vineyards with great sun exposure, with soil and microclimate which suit perfectly for Moscato. The vinification method defines soft pressing of the grapes, besides the settling and the clarification with natural enzymatic techniques to keep intact the natural fragrance of the product. Its fermentation is strictly under controlled temperature, stabilization is in cold environment and bottling in sterile environment. 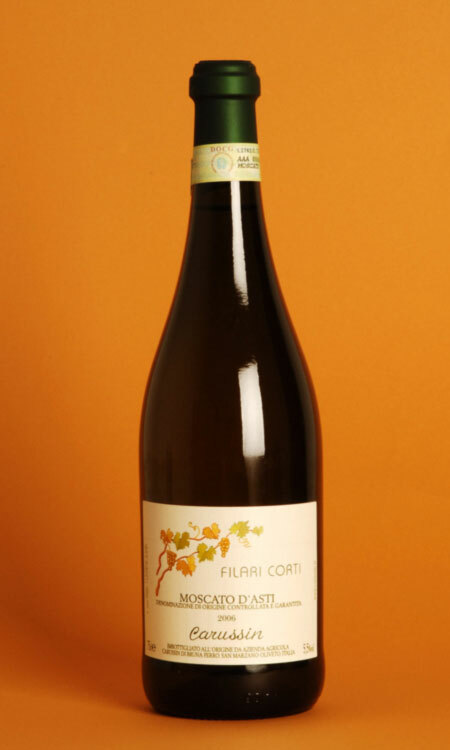 Moscato d’Asti Filari Corti has its name from the rectangular shape of its vineyard, which required an implementation of the rows transversally. Because of that need rows are circa 200m long, giving the wine the ironic name “Filari Corti”, as “Short Rows”. It is a typical desert wine, but having it just at the end of the meals would be too diminishing for such a product of exceptional characteristics that make it unique all over the world. It offers a great company on chats among friends. In the vineyards: Matteo and Luigi Garberoglio. In the cellar: Luigi and Luca Garberoglio.